Someone emailed me the other day and asked me if I could update them on new blog posts. It got me thinking about how I stay up to date with people’s blogs and topics I’m interested in, and then I realized I’ve never talked about something I use every single day – Feedly. This is one of my most used tools for productivity and learning. I have the pro version of Feedly because I use it so much. First, it’s important to say this. There is a lot you can do on Feedly and you can waste a lot of time if you are not careful. For instance, I have a lot of blogs and keywords that I follow on Feedly, and I could be on this site for hours upon hours. It’s easy to read article after article, start searching for new blogs to follow or even get lost on the internet after clicking out on one of the blogs to learn more about the topic. I’ve had to tell myself that Feedly needs to be used for finding information that I want to find, keeping up with blogs that I want to keep up with, and sharing information on social media related to my interests, and I don’t need to read every single article that I come across. If I use Feedly as a tool in the way I intend to use it, then it becomes something that helps me save time. So, I recommend you find a way to use it as a tool to make your life easier or more productive and then use it in that way on days when you are trying to be productive. Isn’t it funny how one thing can completely waste or totally save time depending on how you use it? This is the number one reason I use Feedly. You can create as many feeds as you want around different interests that you have and then include as many blogs or keywords as you want in those feeds. Keyword alerts is a big bonus for me and my writing. I used to use google alerts to keep up with keywords and it was a mess! I would get a ton of emails a day and because it was so overwhelming, I wouldn’t read anything. Now, I just plug the keyword into my feed along with the blogs that I’m following, and it’s all organized for me in my feed. I don’t need to deal with a ton of emails, I just need to scroll through the titles and see what interests me. For instance, one of my feeds is vegan news. I have vegan-focused blogs that I follow under vegan news and I also follow some keywords, such as ‘vegan and Canada’ to keep up with vegan news where I live. 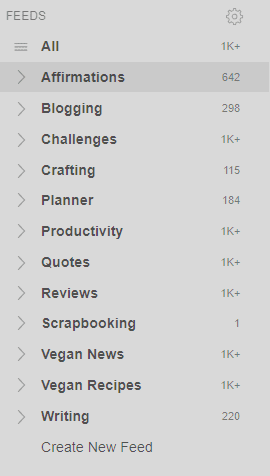 As you can see beside the ‘vegan news’ feed, it says there are over 1 thousand articles to read. That’s what I’m talking about when I talk about wasting time. You could literally be looking at articles all day if you don’t take control over how you use Feedly and how much time you spend on it. What’s great, though, is that you can filter the articles to read the most popular, which comes in handy if you want to find stuff to talk about or share on social media. You can also check out the oldest articles that you haven’t read or the newest articles that you haven’t read. The numbers 10k, 2k, and 1k below the titles and beside the blog name are supposed to be an indicator of how well the stories are doing on Feedly and on social media. I don’t really understand what they mean. I just know that the higher they are, the more popular the article. Feedly’s blog talks about the colors of these numbers and what they indicate for popularity but doesn’t include the green color so I think it’s an old blog post. I know that the bigger number means more people are interacting with the article in some way, and that’s all I need to know. I’m not super analytical with this site. One of the ways I’ve used Feedly in the past and will use it soon again is for studying. I love learning, and you can easily create a feed that gives you something to read and learn from. For instance, I plan on studying photography for the remainder of the year. I’m devoting an hour a day to it. While I do have a book that I’m kicking off my learning with, I can fill in times that I don’t feel like using my book with Feedly. What’s great is that you can filter down to related topics, so if I want to learn more about adobe or Pentax, I can do that too. It will be a great complement to the book I’m using as I can branch out beyond the book and get a ton more information about the topic I’m currently learning. The next thing I use Feedly for is their boards. It’s kind of like Pinterest, where you can save a certain thing to a certain board, but instead of just pictures that link out, you can save the articles that you want to save. For instance, I have an Appetizers and Dips board for future appetizers and dips I want to make. You can see that it has some stuff saved on it, and I can add another story/article if I want directly from the board. I just have to enter the URL of the article I want to add and it gets added in there. 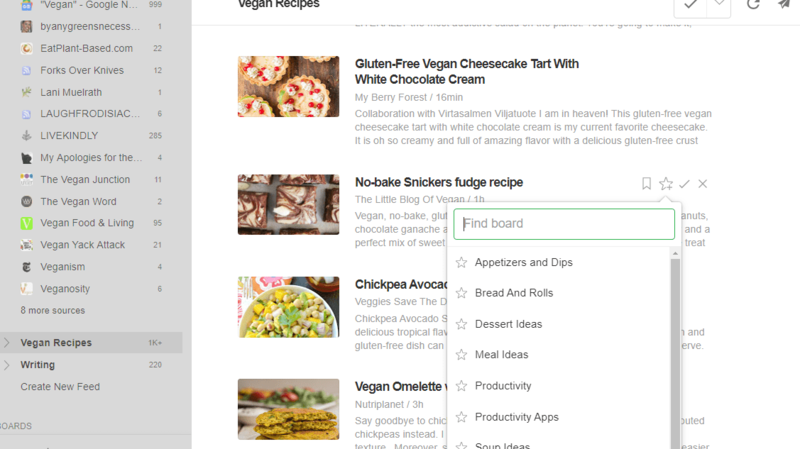 You can also add something to your board as you are reading through Feedly. For instance, as I’m scrolling through the vegan recipe, I see No-Bake Snickers Fudge Recipe, and I definitely want to add that to my dessert ideas board. This is something else I use, but not as often as the other things. I saw one person say that she simply shared content from her Feedly for one week and gained over 300 followers. I don’t know if that’s true. I’m not a huge social media user, so I haven’t tried out that theory. But I do know that Feedly makes it easy to share articles to the sites I want to share them to. For instance, I can easily share to Twitter. Twitter is the one place where I do interact with occasionally with a vegan-focused account because I can quickly find vegan information and stories. If I find something I do want to share from Feedly, all I do is click on the Twitter icon and I can share an article without leaving Feedly. I can also send stuff to OneNote, which is something else I use a lot, especially for recipes. 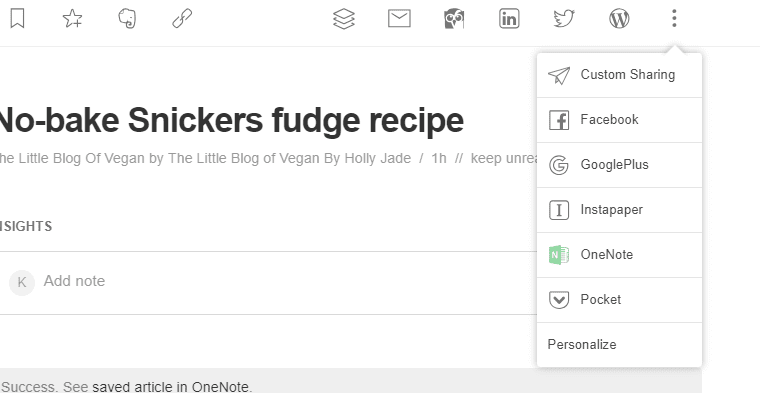 So, you just click on the three dots, select OneNote (you have to sync Feedly and OneNote together first, but it’s just a matter of signing in and letting Feedly have access to your OneNote), and then click where I want it to go or create a new section. Super easy. There’s a lot more than I’m sharing here when it comes to Feedly. I use what I talked about, but there are other features that you may find valuable. For instance, you can take notes on articles and save them so you can view them later. I’ve used that a couple of times, but not often. Mostly, you can follow blogs that you are interested in. 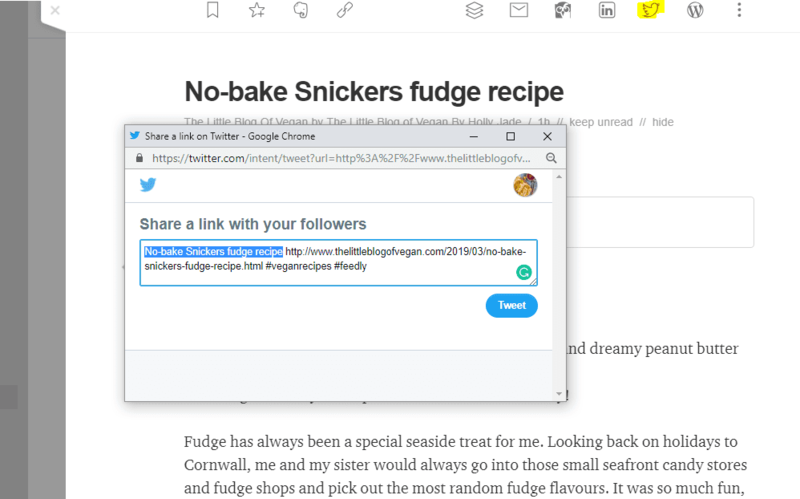 Every new post will be one there, and you can easily create a feed with just a few of your favorite blogs to keep up-to-date. I used the free version of Feedly for years, and it was fine for me. 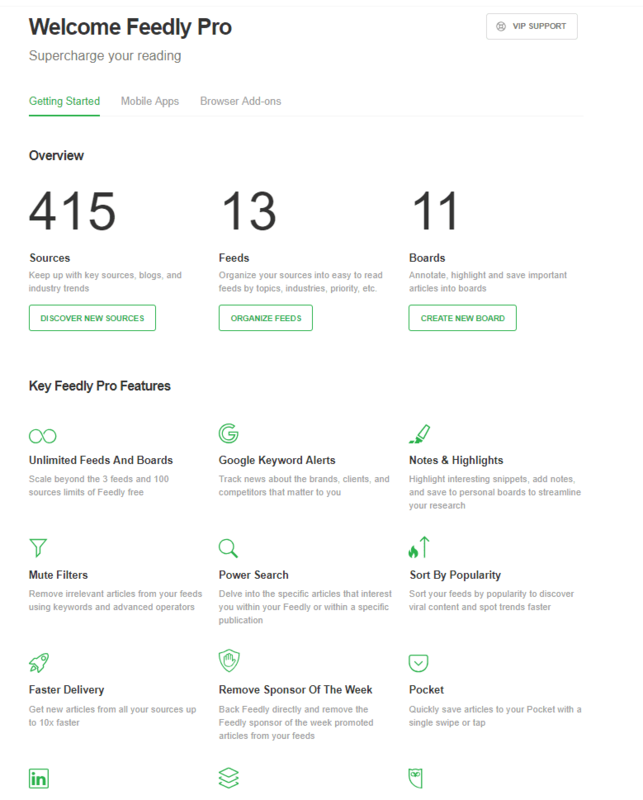 I’ve just gotten more serious about my writing and being productive, so I needed to get the pro version of Feedly to help me find things quicker, organize them, and get things done. 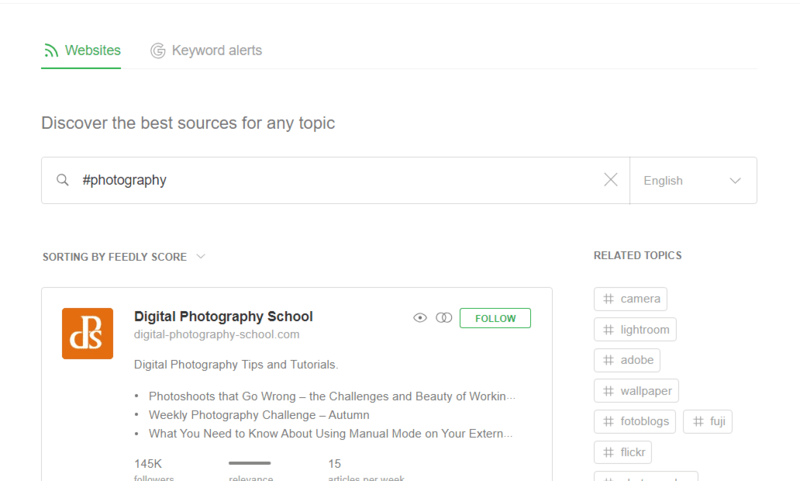 If you enjoy reading blogs, want to search for specific content, or want to do something else with content on the web, Feedly can probably help. I’ve never had any problems with it.